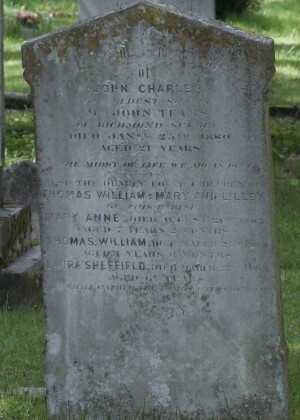 Headstone reads "In Eternal remembrance of John Charles the eldest son of Mr John TEAMS of Richmond Surrey died Jan 25 1880 aged 21 years The midst of life we are in death. Also the dearly loved children of Thomas William & Mary Ann LILLEY of this Parish. Mary Anne died Aug 20 1882 aged 7 yrs 2 mths. Thomas William died March 24 1883 aged 4 yrs 11 mths. Laura Sheffield died March 27 1883 aged 6½. He shall gather the ? with his arm "